Brian is the editor at large of Edible East End, Edible Long Island, Edible Manhattan and Edible Brooklyn. He writes from his home in Sag Harbor, New York, where he and his family tend a home garden and oysters. He is also obsessed with ducks, donuts and dumplings. New York-made wine is having its latest moment of fame, just in time for New Year’s Eve drinking inspiration, with a 10-second trailer running on one of the big screens in Times Square. Earlier this fall, at a sold-out forum in New York City organized by Food Tank, we learned how massive our food waste problem has become. Here are some examples of what Edible communities across the country are doing to combat the problem. What happens when you assemble eight of the Empire State’s top chefs to prepare an historic brunch? You get to taste what a food and drink powerhouse this great state is. Our screening of “A Place at the Table” at the Times Center provoked an impassioned post-film Q&A about hunger in New York and beyond, with Edible readers and ‘wichcraft eaters asking, “What can I do to solve this problem?” Here we try to answer. 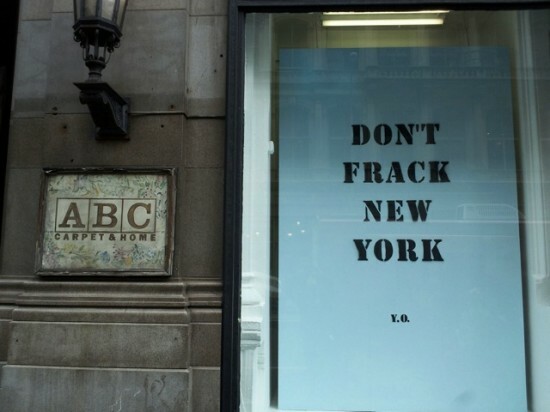 New York celebrities and food luminaries are lining up against fracking in the city’s watershed, including a new coalition of food and drink businesses formed to push elected officials to ban fracking in the state, and to send a message to the whole nation. If you couldn’t make it to the joyous sipping and supping fest that was Brooklyn Uncorked last week, check out this video recap. And remember that Long Island wine country is open all year long. Get ready for a seasonal seafood festival where you get to stroll among chefs plying gazpacho oyster shooters, bluefish sliders, New York squid and all manner of fish-forward awesomeness, alongside New York beers, on the beautiful Hudson River waterfront in lower Manhattan. How Americans developed a taste for one of the greenest ingredients in the sea. Recently, when Stephen and I sought refuge from the frigid avenue in a dark-lacquered, high-backed booth at Talde in Park Slope, there were several clues we had come to the right place.